By the mid eighties Kennedy and I had been living in Wells and making murals for over twenty years. People felt that there should be a piece of our work up somewhere in the city, and at first this was to be in the town square on the wall of the Crown Hotel. It proved difficult to raise sufficient funds for this project so when Tesco came to the area in 1990 and applied for planning permission for a large superstore, it was they who were approached to commission a mural. 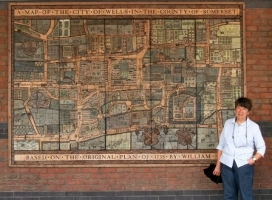 The theme was to be the one we had originally suggested: a mural based on the William Symes map of 1735. This sounds a dry subject, but early maps have been the theme of several of our murals. Instead of blocks representing each building or feature, early cartographers often depicted these in elevation. The street plan of Wells has altered little since mediaeval times and together with modelled features like the Cathedral and Bishop’s Palace the named streets can readily be recognised. Only a few copies of the Symes Map remain: one can be seen in the Castle Museum in Taunton, another in the Wells Museum, where prints are available for sale. I had to draw the map up very carefully because much of the detail is difficult to read, and we were to enlarge it by many times. We shifted around various coats of arms but overall we stuck pretty closely to the original engraving. Many of the houses are repeating units. We analysed this and made press tools to create tiny houses, each about two or so inches across. This brings a rhythm to the whole and keeps the spirit of the original map. According to William Symes, Wells in 1735 had immaculate and well tended orchards and gardens. I represented the orchards with small formalised trees and the gardens and fields with abstract patterns and textures. There are various people, animals and carts in the original map and we added more to add extra interest and detail. We also introduced a compass rose to mark the site of the new Tescos. “You are here.” The mural went up just before Tescos opened in 1991. It was originally placed immediately inside the store but has since been moved twice to accommodate different new developments. An accompanying notice explains the map a little. It tells us that water running from the Moat supplied the power to work five mills. Unfortunately there is a printing error in this which must baffle the careful reader. The water is described as “running five miles”.